What does haters gonna hate mean? Haters gonna hate is an informal way to express consolation, voice encouragement, or dismiss criticism. The phrase implies that criticism says more about the critic, or “hater,” than the person being criticized, i.e., that they are making judgements out of jealousy or their own negativity. Where does haters gonna hate come from? The term haters started showing up in hip-hop lyrics in the early 1990s. The Right Rhymes, a hip-hop dictionary, traces the term back to the 1991 song “Psycobetabuckdown” by Cypress Hill. Throughout the early ‘90s, haters appears in a number of other songs by various artists including Too $hort, 2Pac, and Sir Mix-A-Lot. Please don’t hate me because I’m beautiful baby. Then, in Ice-T’s 1999 song “Don’t Hate the Player,” the rapper describes haters as “Actin’ like a brother done did somethin’ wrong / cause he got his game tight.” As these lyrics suggest, haters are fueled by jealousy and so their criticisms can be brushed off. The 2000 song “Playas gon’ Play” by the R&B group 3LW appears to be the first use of the specific phrase haters gonna hate, at least in song lyrics. The phrase took off online in the late 2000s. Graphic designer Omar Noory used an animated GIF of a chubby child strutting, with a thought bubble that reads haters gonna hate, as a forum avatar in 2009. That year, a trend emerged of applying the phrase as a caption on pictures of people or characters walking proudly, displaying a cavalier attitude, or shamelessly acting strange. One notable instance featured a very fit man rollerblading in nothing but a Batman mask, cape, and speedo. In a humorous riff on the meme, rhymes like gators gonna gate and potatoes gonna potate popped up, accompanied by images. 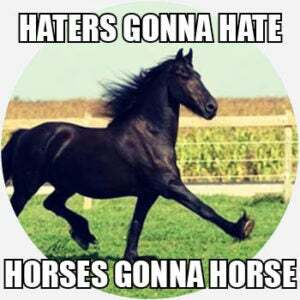 The phrase haters gonna hate peaked on Google Trends in February 2012, with BuzzFeed notably publishing a listicle of some of the more outrageous memes. By this point, the phrase had spread beyond its hip-hop origins. It also prominently appeared in the chorus of Taylor Swift’s 2014 pop mega-hit “Shake it Off.” R&B singer Jesse Braham, who used haters gonna hate as well as players gonna play in a song of his own a year earlier, sued Swift over her use of the song. The court dismissed the case because Braham “hadn’t provided enough factual evidence” to prove plagiarism. The earlier and widespread use of the term didn’t help Braham’s case either. Who uses haters gonna hate? Although haters gonna hate began in hip-hop, its use has become widespread in mainstream culture. What began as a specific dismissal of criticism morphed into a positive affirmation and an exhortation to do things your own way, to be yourself in spite of what other people may say.